This entry was posted in American Cheese, Appetizers & Snacks, Baked Goods, Balkan Cheese, Bleu Cheese, Bread & Grains, Breakfast, Buffalo Mozzarella, Burgers, Cheddar Cheese, Cheese, Chesseburger, Cooking, Cream Cheese, Cuisine, Dessert, Dinner, Eating, Ementhaler Cheese, Feta, Food, Gorgonzola, Gruyère, Jalapeno Cheese, Manchango Cheese, Mozzarella, Parmesean, Pecorino Romano, Processed Cheddar, Provolone, Quotes, Recipes, Ricotta Cheese, Romano Cheese, Swiss Cheese, Whited Cheddar Cheese. Bookmark the permalink. 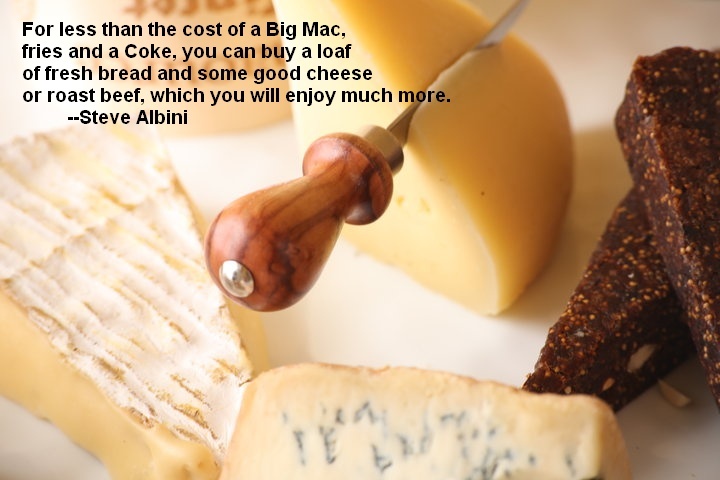 6 Responses to Big Mac or Fresh Bread and a Cheese Plate? I don’t live in Berkeley, but whenever I’m there, I dip into the Cheese Board…sometimes they have these amazing bargains on unique and strange cheeses…I had some mouthwateringly fresh Queso Fresco the other day. Just fabulous. And what a great quote! Long live le baguette! My cheese story? Living in China makes me miss cheese most of all. How I hunger for the taste of parmigiano reggiano again! Your blog is, as always, a great read! You’re not supposed to buy heaps of cheese all at once. It’s not supposed to last forever without spoiling. You buy a hunk or two, that loaf of bread, and go sit in the park and enjoy it. Relax, take it easy. Walk or ride your bike to the cheese monger, the baker, and the park. Slow down. I first tasted epoisses, eleven years ago, at Willy’s Wine Bar in Paris. I breathe in that memory. Taste it. My cheese story. I love it. We always buy it for lunches when we’re traveling. And at one place had the best cheese plate ever, in Melbourne. My wife and I also had some wonderful wine that night and let’s just say I remember the cheese better. That’s a very good question actually – what actually is a traditional “American Breakfast”? Is it similar to the traditional English one with bacon, egg, etc? There’s a place in Paris called “Breakfast in America” which does various “American-style” breakfast dishes… I’m not sure how they stack up for comparison against the real thing in the US but they seem popular nevertheless. As for cheese – I was just saying to my wife the other day that I wish I could invent something which stopped the spoiling of food. I love to buy lots of cheeses, but the thing is, I don’t eat them as often as one should, once you have a huge pile of cheese in the house, so a lot ends up spoiling. My local store has a massive cheese section. 8 aisles of cheese, including artisan and speciality cheeses! Cheese heaven! Luckily they don’t sell Casu Marzu and I hope they never do!